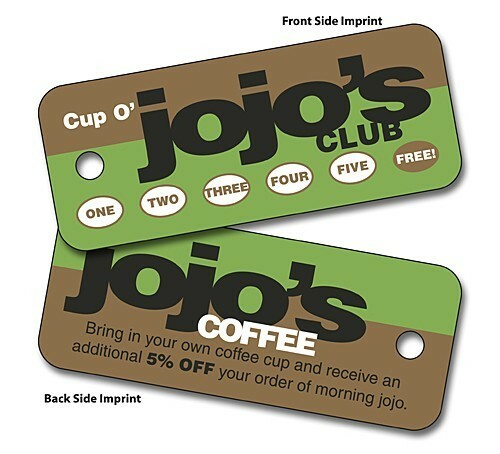 Key tags are a handy way to keep your information in front of your customers. Perfect for libraries, book store, member identification, gyms, yoga studios, ID, schools, food or lunch programs, computer services, insurance agents, restaurants, pest control services, heating & cooling services, medical care professionals, safety reminders, car dealers, car rental agencies, church prayer reminders, travel advisories, ski lodge guest, hotel and motels, youth group outings, cruises and travel events, etc. This rectangle shape key tag has a .1875 inch diameter hole punch for placing the fob on your key chain, zipper pull tag, backpack inner pocket - anywhere that is handy. 2.75 in. x 1.125 in.